When seeking a true taste of Malaysia and Singapore, the first thing that comes to mind is a bowl of laksa – steaming hot with a medley of seafood, coconut milk and spices. Time Out slurps its way through the best laksa in Hong Kong. Looking for authentic Malaysian and Singaporean cuisine? Look no further than Café Malacca, which takes you back to the hawker stalls of Malaysia with house specialties such as beef rendang and satay. But to seriously feed your hunger, it’s all about Café Malacca’s laksa offerings. 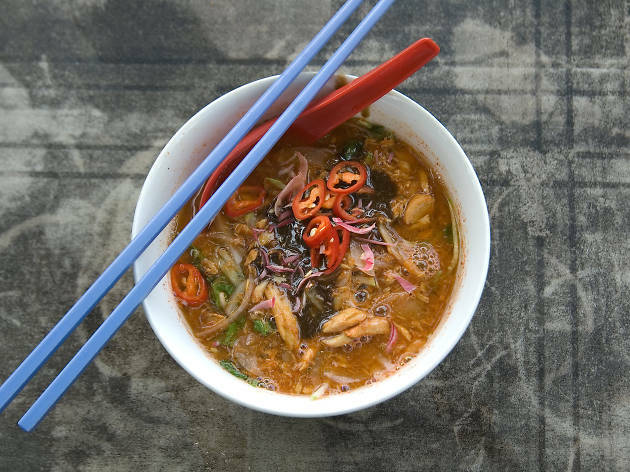 As well as the common Singapore style, it offers equally delicious and much harder to find elsewhere in the city, Penang assam laksa. There’s no coconut milk to be found here, it’s honest, homely fish broth, infused with the perfect balance of tart and sour and a hit of spice at the fragrant back end. Recommended Bib Gourmand in the Michelin Guide in 2014 and 2015, you can leave knowing you dined on one of the best dishes in town. Level 2, Hotel Jen Hong Kong, 508 Queen’s Rd W, Sai Wan, 2213 6613; hoteljen.com. It often seems like all the best eateries in town come in small packages, and it’s no different here. With a name like Katong Laksa, you better believe the laksa is the highlight of the menu. It’s aromatic, with a nice milky coconut broth that packs just the right amount of heat for its thick, chewy rice noodles. Just be sure to get there early if you come around lunch. Shop D1, G/F, 155 Jaffe Rd, Wan Chai, 3168 2478. True to its name, Hawker 18 specialises in your favourite street-style dishes. The sizeable laksa features a silky, creamy coconut broth that’s not too spicy – perfect for those who have a lower tolerance for spice – plus a healthy serving of toppings. With the restaurant styled in a light and airy manner, you’ll be on cloud nine in no time. Shop 410-412, Level 4, Metroplaza, 223 Hing Fong Rd, Kwai Fong, 2156 2228; hawker18.com.hk. A departure from your usual hawker fare, the buffet at The Market features a surprisingly strong contender. Its laksa lemak has a velvety coconut broth that’s extremely fragrant, but best of all, you can choose your toppings and enjoy your laksa exactly the way you like it. 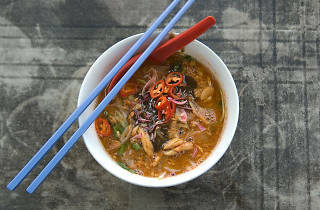 Yet with so many other regional delicacies on the menu, the laksa might not be the only reason to eat your heart out. Lobby Level, Hotel Icon, 17 Science Museum Rd, Tsim Sha Tsui E, 3400 1318; hotel-icon.com. This humble eatery comes with an underwhelming, simple menu. But what they offer is lovingly crafted and executed to perfection. Run by a Penangite chef, one of their signature items is the slurp-worthy Penang kari mee (curry noodles) that is much lighter but more aromatic than it's creamier cousin, the Singapore laksa. Other noteworthy items include the char koay teow (fried flat noodles) and, on rare occasions, the famous Penang hokkien mee (prawn noodles) – call ahead to check whether it’s available. G/F, 3 Hoi Chak St, Quarry Bay, 5236 1363. Head over to Wan Chai’s Sabah, home to some quality Malaysian food and Singaporean dishes. The fresh noodles in its laksa have a nice texture and come swimming in a thick coconut and curry broth, splashing against the copious amount of seafood toppings and chicken. If you have any room for more, be sure to try the Hainan chicken rice. 98-102 Jaffe Rd, Wan Chai, 2143 6626.